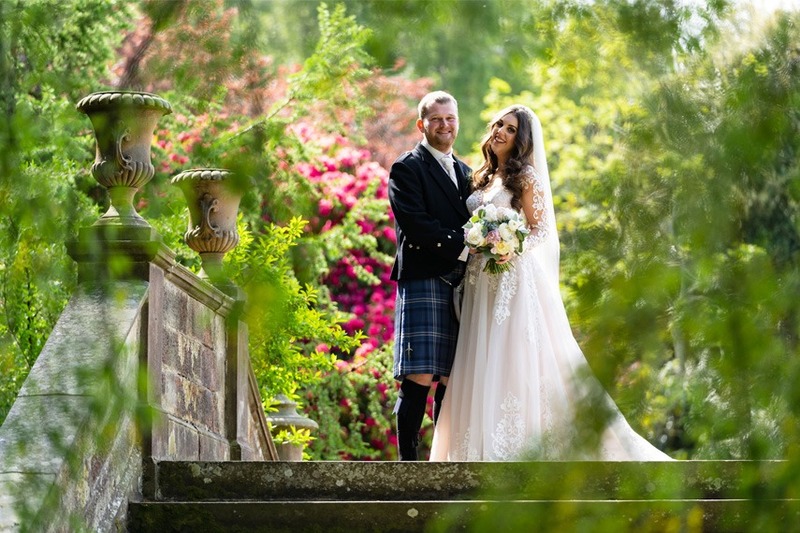 Gilmerton House were very grateful to Lee and Chris Lothian, who wed earlier this year at the venue and supported the below wedding feature, based on feedback of their family summer wedding. How many other wedding venues did you visit? “We narrowed our list of wedding venues to 15 and went to look at 5,” say Lee and Chris Lothian, the bride and groom. “Gilmerton House was the fifth and we knew straight away it was the perfect venue for us. “Exclusive use was really important to us. We wanted to be in a place where we would only be surrounded by our friends and family. In the end, we had 58 guests keeping it to our closest friends and family only. Why did you choose Gilmerton House as your wedding venue? It is a truly beautiful venue inside and out with stunning grounds. The impressive drive up to the front of the house lets you see how grand Gilmerton House really is. When we arrived, we were welcomed into the marble hall with its stunning fireplace and beautiful decor. We were shown the two amazing rooms we could get married in, together with the 10 bedrooms, and a huge room with amazing light for the bridal party to get ready in. We fell in love with the venue and could picture ourselves having exactly the Wedding we wanted at Gilmerton House. The venue matched our ideas really well which made it easier for us to plan our wedding. The staff were also really friendly, welcoming and great to deal with. The venue is exclusive use and allowed for 24 of our guests to stay with us for the full weekend. This meant we would be able to have our closest family and friends with us all weekend which is exactly what we wanted. Did you get your ideal date or did you have to compromise? We booked the venue almost immediately after viewing it for the first time. Gilmerton was extremely flexible when it came to choosing our date which allowed us to have our ideal wedding date: ‘a Saturday in May’. How did your wedding day unfold? As neither of us have ever been married before we really had no idea how the running order of a wedding should go! The wedding manager of Gilmerton House and coordinator from the catering company listened to our ideas and helped us to plan and add structure to our day. We really appreciated their input. We both got ready separately in the house on the morning of the wedding. Our guests arrived around 2pm for a Groom’s Reception accompanied by music from our string quartet. Our ceremony took place at 3pm followed by a group photo. We then had drinks and canapés outdoors thanks to the glorious weather where we had a gin bar set up and music continued from the string quartet. Speeches were at 5pm followed by the wedding breakfast. We cut our cake just before 8pm and then danced the night away to our band with our guests until midnight. The venue facilitated this really well and made it a stress-free day for us. Which rooms did you select for your ceremony and reception? Our ceremony took place in the beautiful drawing room downstairs. This leads directly outside into the gardens where we hosted an outdoor drinks reception. The evening reception took place upstairs in the amazing oak lined Music Room. We really enjoyed being able to use the full house and grounds on our wedding day. How did you choose your menu? The venue provided us with a list of trusted caterers. Each offered something different and you could really make it your own. Gilmerton were more than happy to liaise with the catering companies to ensure our choices were possible while the caterers worked with us to create the perfect menus. What did the staff do to ensure your wedding went smoothly? Staff at Gilmerton couldn’t have done more. From the warm welcome we all received on the Friday, to ensuring we always had a drink and anything else we needed, to the moment we left. It truly was a 5-star experience. They made us feel at home and took the stress away from the day as we knew we were in very safe hands.The team was superb. From day one they were always happy to answer any of our many questions and point us in the right direction. They dealt with all of our suppliers over the weekend, making it stress free for us. We couldn’t have asked for a more supportive and capable team at the venue. Everyone was fantastic. To what extent were you able to personalise your big day? 100%. The wedding venue was very flexible and happy to accommodate anything you could want. The venue is a grand Georgian stately home which needs nothing additional. We only supplied the personal touches, such as flowers, centre pieces, candles and stationery. How long did you stay at the venue? We stayed at Gilmerton House for the full weekend arriving on the Friday afternoon and leaving at Sunday lunch time. We had our parents and bridal party stay with us for the full weekend. The accommodation was outstanding. There were 10 beautiful bedrooms each with their own bathroom and a separate cottage for an additional 6 guests to stay in. Gilmerton House really is a hidden gem. The house and grounds are stunning and the staff are exceptional. You can really make the day your own and you feel at home from the moment you arrive. You get exclusive use of the venue. What more could you ask for? We struggle to pick a favourite feature as the whole venue is incredible. Any advice for other couples getting married at Gilmerton House? Relax and enjoy your day and fully trust the staff to take care of everything. If you can, get the venue for the weekend. We loved being there on the Friday and it made us feel at home immediately. This took away any last minute nerves and helped us have a stress free weekend. For more information about Gilmerton or to enquiry about hosting your wedding, please visit the venue page.